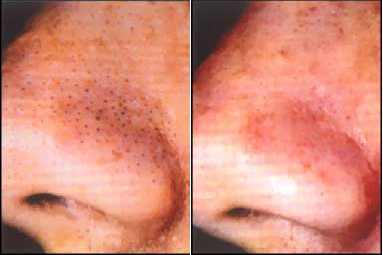 Blackheads are those nasty black/brown looking dots on skin that arise around the nose, chin, back, face and everywhere. 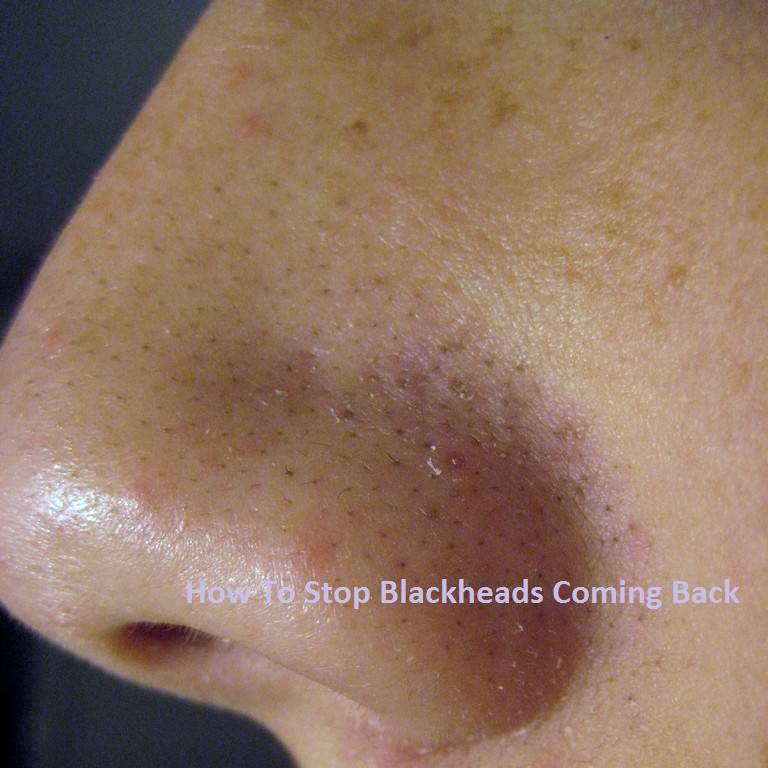 You probably think they are hard to stop from coming back but surprisingly not when you know how to stop blackheads from starting in the first place. Read on if you want to find out how to ‘get rid of blackheads’ effectively. On the surface of the skin there are millions of tiny pores (that look like holes) and these pores serve a purpose. None of these can happen without the sebaceous glands (which are glands under the skin that create a oil called sebum) and there job is to regularly and routinely create the oily substance that will then push its way up the pore and onto the the surface of the skin. Sebum is what keeps the skin from damaging, drying out and becoming infected by taking dead skin cells, bacteria and dirt that get trapped in pores up and on to the surface. Dead skin cells are created by the shedding of skin and hair follicles and these need to be pushed up the pore to avoid blockages and infections. To stop blackheads, find out what causes them. There are many causes of blackheads but the main causes are sebum, dead skin cells and irritation. The dead skin cells on the surface of the skin sometimes get pushed back over the pore due to touching with fingers, excess sebum or excess dead skin cells and combined with the oil will turn into a sticky substance like PVA glue. Now this may sound serous however is just like a sticky plug and will not remain there forever. Once the pore is blocked the “sticky plug” will oxidise in the air and turn a brown/black colour due melanin in the skin. (melanin is a tanning chemical and gives the skin its colour) This is what we see as a blackhead, a sometimes slightly raised black dot on the skin which looks dirty, embarrassing and unclean. Let me reassure you its completely not that. This is a great tool to have especially for removing big blackheads that just wont budge. Dermatologists, doctors and skin specialist use these tools because they are a clean, effective way to remove blackheads without causing more breakouts and inflammation. This one here is rated 4-5 stars by over 200 people on amazon and now 57% off if you click here. Essential tool for the bathroom that will last a lifetime. However this is not the only thing I used for my thousands of blackheads, in face I only used this roughly once a week because when I started using this product on my face it reduced blackheads returning. The product contains salicylic acid which is a well know active ingredient along with benzoyl peroxide for acne treatment especially for late teens to adults. Salicylic acid is a excellent acid the digs deep into pores and drys out the excess oils, removes dead skin cells and fights existing inflammation all in one. You can see why this works great with the blackhead remover above. Use the salicylic acid at night before bed. Leave on overnight. Use the blackhead remover after a warm/hot shower to get the blackheads that need attention. Always use cold water last after using to close pores. Doing this daily reduced my blackheads within a week and a bit. And the great thing about the blackhead remover is you can use it on pimples to however personally I prefer to use it on blackheads because I avoid touching pimples completely because it makes things worse. So, we have talked about how can remove them now lets find out how to prevent blackheads By using this it will prevent blackheads starting from the root in the early stages and this is because the salicylic acid will break down the cause of the problem and reduce the chances of blackheads coming back. Its very simple to use and contains 2% salicylic acid which is more than enough for blackheads and will clear them out. I have never come across this deal on Amazon this good but limited time only a whopping 80% off – so get it Now! You have found out effective, useful ways to stop blackheads and treatments that are easy to use. I used the product for my blackheads as directed and this worked for me so its all explain when you buy. The blackhead remover is a life saver and I use it to this day still for those cheeky blackheads that pop up on when I am not expecting. I personally hate blackheads and I am sure you do to, that’s why your here. See More Reviews For Clean And Clear Here At Amazon.